Tyrannosaurus Rex was one of the most fearsome predators ever to walk the Earth, but there’s a new trend that really brings out the dinosaur’s sillier side. An inflatable T. Rex costume is the best comedy prop out there these days despite its prehistoric origins. Specifically, it’s Rubie Costume Co.’s officially licensed “Jurassic World” costume, but all you really need to know is that it’s goofy as hell, and you can be surprisingly active (and hilarious) while wearing it. It took lots of training, of course. Sam Sendel, a member of the Canadian trampoline team, showed off what the T. Rex can really do. There’s something innately hilarious about the costume — which costs at least $150 on Amazon. Maybe it’s the sheer comic thrill of seeing a long-extinct dinosaur try to navigate daily life and perform human tasks. 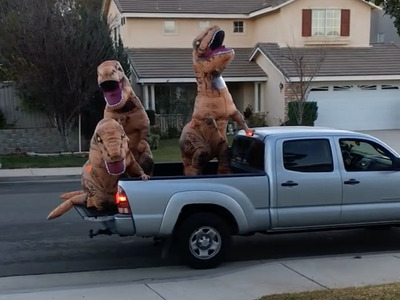 Or maybe it’s the way the head of the costume flops wildly around, almost as if T. Rex is constantly throwing its head back to scream out a joyous “yaaass” with nary a care in the world. Look at how much fun these guys are having. Even when they get into trouble with other dinosaurs, you can’t help but but love ’em and laugh at their Jurassic shenanigans. Ride on, you beautiful tyrant lizard king. Ride on.